A surprisingly expressive nose presents highly complex red berry, game and warm earth nuances that introduce delicious, sappy and mouth coating medium plus weight flavors that possess a firm muscularity and the classic youthfully austere finish of imposing length. I like the balance here and while the tannins are presently unyielding, sufficient mid-palate sap exists to buffer it over time. Pinot Noir is responsible for some of the world’s finest wines. Famed for producing the red wines of Burgundy and the Côte d’Or in particular, it is now widely grown in cool climates across Califonia and Oregon, and with increasing success in New Zealand. Although typically used to produce varietal wines, Pinot Noir makes a significant contribution in the wines of Champagne, where it is vinified as a white wine and blended with Cardonnay and Pinot Meunier. On the whole, fresh summer fruit of strawberries, raspberries and red cherries tend to be the identifying qualities, however richer versions express darker fruit including black cherries (kirsch), cherry cola, leather and violets to name a few. A country viewed by many as the home of fine wine, it is almost unique in terms of how embedded food and wine is in the nations culture. Given the diverse geography, with so much of the country providing the climate and soil suitable for viticulture, it is no surprise that its produces such an extensive and varied selection of wines. It is the country from where the vast majority of the New World's most popular "international" grapes and stylistic influences originate. While there might seem to be an alarming disparity between the most sought after wines (were a case might set you back as much as a deposit on a small house) and the millions of gallons of vin de table filling up the European wine lake every year, there is so much great value to be found between the two extremes. Bordeaux, Burgundy, Champagne, and the Rhone may still dominate the market for fine wine, but regions including the Loire, Alsace, Languedoc & Roussillon and the South West are increasingly becoming excellent sources of good quality, affordable wines. Two hundred miles south east of Paris lies the famous and historic wine region, known in French as Bourgogne. The Cote d'Or, the heartland of the region, consists of two distinct sub-regions split on either side of the town of Beaune.The Côte de Nuits to the north, includes the famous villages of Vosne-Romanee, Gevrey-Chambertin, and Nuits-Saint-Georges and are known primarily for making red wine from Pinot Noir.Although The Côte de Beaune to the south still makes some magnificent reds (see Volnay and Pommard), white wine made from Chardonnay is the main focus. The most famous villages are Puligny-Montrachet and Meursault. Burgundy has three other important regions. The village of Chablis (exclusively Chardonnay) encompassing the region's most northerly vineyards. The Côte Chalonnaise and Mâconnais to south are quantitatively speaking more important. Agriculture is more diverse with a significant portion of the land devoted to livestock and arable farming. Vougeot is a small village in the Cote de Nuits. 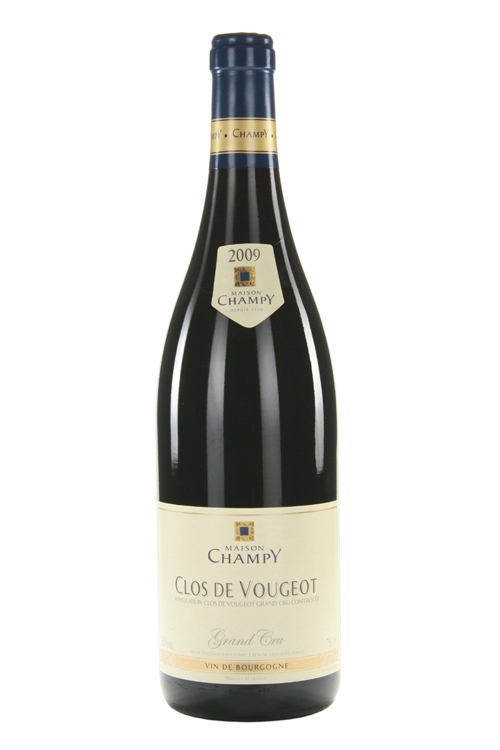 It is famous for the walled vineyard, Clos de Vougeot, planted by Citeaux monks in 1336. It is one of the largest grand crus in the Cote totaling just over 50 hectares and spans from Musingy, at the top, all the way down to the RN74 road which connects Beaune with Dijon. With varying soil structure, differing aspect and drainage, and a crowded 56 growers vinifying small plots, it's produce can be highly variable. It is no wonder, with the grand cru's size and fame, that the four premier crus: Les Cras, La Vigne Blanche, Clos de la Periere, and Les Petits Vougeots, and the even smaller 4.83 hectares of village wine, gets overlooked. Generally speaking the wines are more voluptuous and spicier but less robust and well defined as the wines of Chambolle-Musigny and Echezeaux next door.